Palletisers and De-Palletisers are essential pieces of equipment used to improve efficiency and packaging times in your factory. By improving packing speed and reducing the amount of labour hours, you can increase your profitability. By investing in a first-rate Palletiser or De-Palletiser from Asmech Systems you will reduce the amount of manual handling of your product, which will in turn prevent breakages caused by human error. With a Palletiser or De-Palletiser your capacity output will increase and productivity will rise. Palletisers are ideal for processing bottles or containers into cardboard trays, to then be stacked onto standard sized pallets. A palletiser is the perfect piece of equipment for the food and drink industry, as well as a range of other varying industries dealing with bottles and containers. Due to the excellent design of our palletisers, it is easy to change the settings to accommodate different shapes and sizes for all types of containers. This makes the palletiser an incredibly cost-effective and versatile piece of equipment to have at your disposal. In some instances, a De-palletiser may be the solution to improve your workflow, especially if you are having to undertake time-consuming unpacking of pallets of products by hand? The de-palletiser prevents man-hours being lost on unpacking products and does much of the work for you, allowing you to increase your productivity. 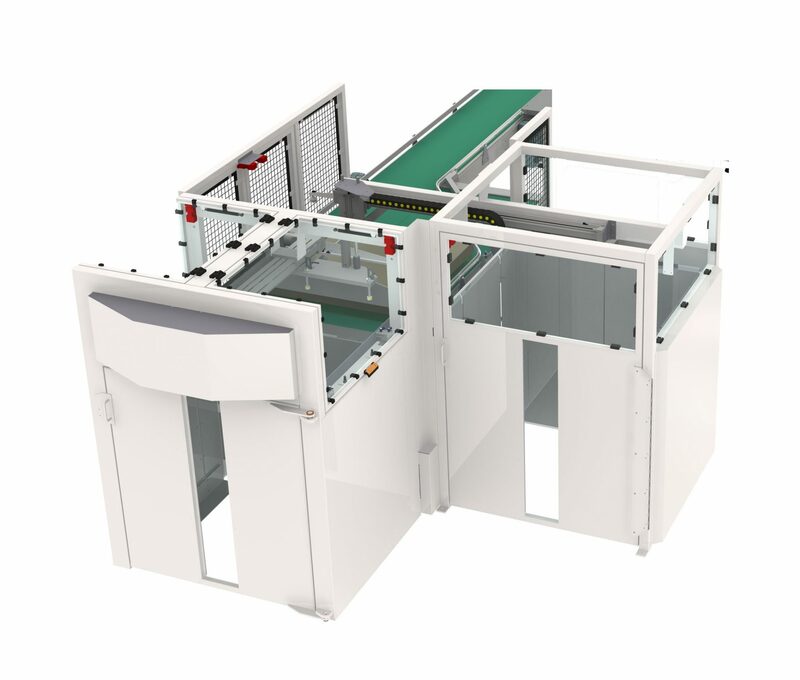 The De-palletiser, like the Palletiser, is easy to adjust and works at a speed based on the product size and stability. At Asmech we also provide Conveyors and Tray Packers which can work alongside your Palletiser to improve your efficiency and workflow. With our complete solution providing design, manufacture, control, project management and installation, we will work with you from your first initial concept all the way through to the end of the project. We can provide first-rate aftersales care to ensure that we continue to look after both and your equipment once it has been installed, thereby protecting your investment. When you purchase a Palletiser or De-Palletiser from Asmech you can rest assured that you will receive excellent advice and support with your decision-making process. We take the time to understand your requirements and the operating processes that you currently use. This enables us to give you the relevant advice based on your circumstances, rather than giving generic advice. All of our solutions are designed to our customers the most efficient process in the most economical way. We treat all our clients, large or small, new or old, with the same level of dedication, respect and integrity that has made us into one of the UK market leaders in the conveyor and materials handling industry. Asmech is the first port of call for all your palletiser requirements. Our highly trained and experienced staff will be happy to talk through your needs and then work with you to ensure that you get the perfect solution for your processing fulfilment requirements.